Azaleas are easy to love. Their amazing flowers put on an incredible display of color every spring like clockwork, helping to herald the coming growing season. Whether in a formal or a woodland garden setting, azaleas make a great addition to any garden. When these plants are in full bloom, it’s almost impossible to see the foliage underneath. For centuries, azaleas were grown only in Japanese gardens. But then native species were discovered in North America and eventually types from both countries found their way to Europe. Deciduous species (Exbury hybrids) are primarily from North America, while evergreen species (Belgian, Southern Indica, as well as Girard and Satsuki hybrids) are from Japan and Europe. Azaleas are versatile and can be used in almost any spot in the garden provided they have good drainage. While Belgian, Girard and Kurume hybrids prefer partial shade in the afternoon, Exbury hybrids, Southern Indicas and Satsuki hybrids can be grown in full sun in all but the hottest areas. Azalea flowers come in almost every color shade imaginable, and the bushes range from dwarf shade varieties of 2-3′, to the sun lovers that can grow from 4-8′ high and wide. Homeowners in mild climates can select almost any species of azalea for their garden. But in colder areas, Exbury hybrids and some of the newer winter-hardy hybrids should be used. They also reward gardeners with good fall colors in shades of orange and red. Many have sweetly-scented blooms. If you are short on space in your landscape, consider planting azaleas in containers to add another dimension to your garden. 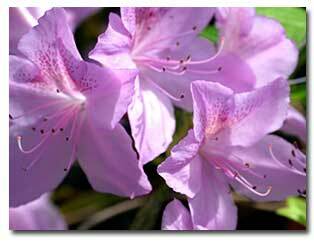 Azaleas grow well in evenly moist and slightly acidic soil. They perform best when the soil is amended with peat moss or an acid planting mix before planting. They also like to be fed every few months with cottonseed meal or an acid plant food. We recommend feeding from the end of the blooming season through early fall. Azaleas don’t require much pruning if the proper varieties are selected for the desired mature size. If occasional pruning is needed to control size or wayward branches, prune from one month after the blooming season has ended through August. Pruning any later can remove the new blooms that are starting to set for the following spring–these can start as early as September. Whether pruned formally into shapes or left natural to blend in with the local surroundings, azaleas make a wonderful addition to any garden, with their extraordinary offering of beautiful spring flowers.